Killer app refers to an application so sweet or so useful that just about everybody wants or must have it. Here are ten free killer iPad apps. TripCase is a free app (and website) that organizes details of each trip in one place, with reminders and flight alerts delivered directly to your iPad. With TripCase it’s drop-dead simple to add your travel events — without copying and pasting or even typing. Just forward your confirmation e-mails — for flights, hotels, rental cars, and other travel-related services — to trips@tripcase.com. TripCase parses the details, creates an itinerary, and sends you an e-mail to confirm that your trip is ready to view in TripCase. After TripCase has your info, you can view it in the TripCase app or in any web browser. 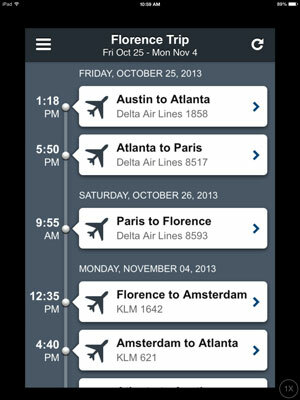 The app is well-organized, with a timeline view of the itinerary, and details are but a tap away. Ever heard a song on the radio or television, in a store, or at a club and wondered what it was called or who was singing it? With the Shazam app, you may never wonder again. Just launch Shazam and point your iPad’s microphone at the source of the music. In a few seconds, the song title and artist’s name magically appear on your iPad screen. The digital arm of the National Football League designed its NFL Mobile app to appeal to the legions of folks who live and breathe the sport. You can watch highlights of games or check out other featured videos, organized under themes like Top 5 Catches, Drive Of The Week, and Can’t Miss Plays. You can also listen to audio broadcasts of games (in English or Spanish). And you can exchange tickets, purchase team apparel, or buy other NFL paraphernalia — hey, in case you haven’t noticed, football is big business. During an actual game, you can chart the action inside an animated graphic of an NFL stadium. Feed the Flixster app your zip code and then browse local theaters by movie, showtimes, rating, or distance from your current location. Or, browse to find a movie you like and then tap to find theaters, showtimes, and other info. Another nice feature is the capability to buy tickets to most movies from your iPad with just a few additional taps. IMDb, shorthand for Internet Movie Database (owned by Amazon), is the place to go for complete cast/crew listings, actor/filmmaker bios, plot summaries, movie trailers, critics’ reviews, user ratings, parental guidance, famous quotations, and all kinds of trivia. If you love TV and movies, too, you’re sure to be a fan of the Netflix app. Over time, Netflix, the company that built its reputation by sending DVDs to subscribers through the mail, started streaming movies over the Internet to computers, TVs, and other consumer electronics gear. You can now add the iPad to that list. 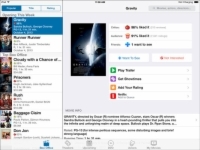 From the iPad, you have more or less instant access to thousands of movies on demand. You can search by genre (classics, comedy, drama, and so on) and subgenre (courtroom dramas, political dramas, romantic dramas, and so on). Comics is actually three apps rolled into one. First and foremost, it’s a fantastic way to read comic books on a 9.7-inch touchscreen. Second, it’s a comic bookstore with hundreds of comics and comic series from dozens of publishers. Finally, this app provides a great way to organize the comics you own on your iPad so that you can find the one you want quickly and easily. 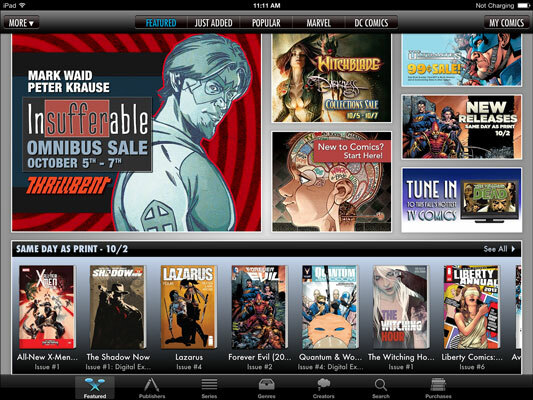 The free Comics app gives you access to hundreds of free comics, or you can use the built-in store to purchase comics, usually $0.99 to $2.99 per issue. Epicurious easily lives up to its billing as the Cook’s Companion. This tasty recipe app comes courtesy of Condé Nast Digital. Tap the Control Panel button in the upper-left corner of the screen to get started, and you can find a yummy recipe in no time. Tap Featured inside the Control Panel (if it’s not already highlighted) to find recipes that have been lumped into categories, often timed to the season. 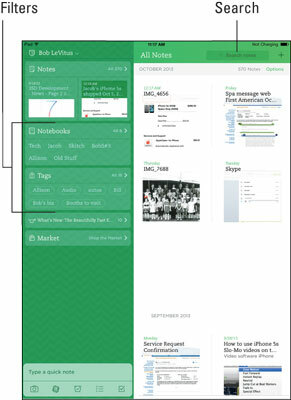 The Evernote iPad app resolves a problem: storing your little bits of digital information — text, pictures, screen shots, scanned images, receipts, bills, e-mail messages, web pages, and other info you might want to recall someday — and synchronizing all the data among all your devices and the cloud. Evernote is all that and more, with excellent free apps for iOS, Mac OS X, Android, and Windows, plus a killer web interface that works in most browsers. You can create notes of any length on your iPad by typing, dictating, or photographing. You can add unlimited tags to a note, and create unlimited notebooks to organize your rapidly growing collection of notes. You can even annotate images and PDFs in Evernote notes, using another free app from Evernote called Skitch. To increase your monthly upload limit from 60MB to 1GB and to get the capability to search for text in PDFs, you can upgrade to the premium plan ($5/month or $45/year). This custom Internet radio service is available gratis on the iPad. And you can play Pandora music in the background while doing other stuff. 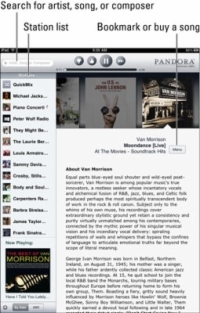 Pandora works on the iPad in much the same way that it does on a Mac or PC. In the box at the upper left, type the name of a favorite artist, song title, or composer via the iPad keyboard, and Pandora creates an instant personalized radio station with selections that exemplify the style you chose. Pandora also takes advantage of the generous screen real estate of the iPad to deliver artist profiles. You may see ads, too.